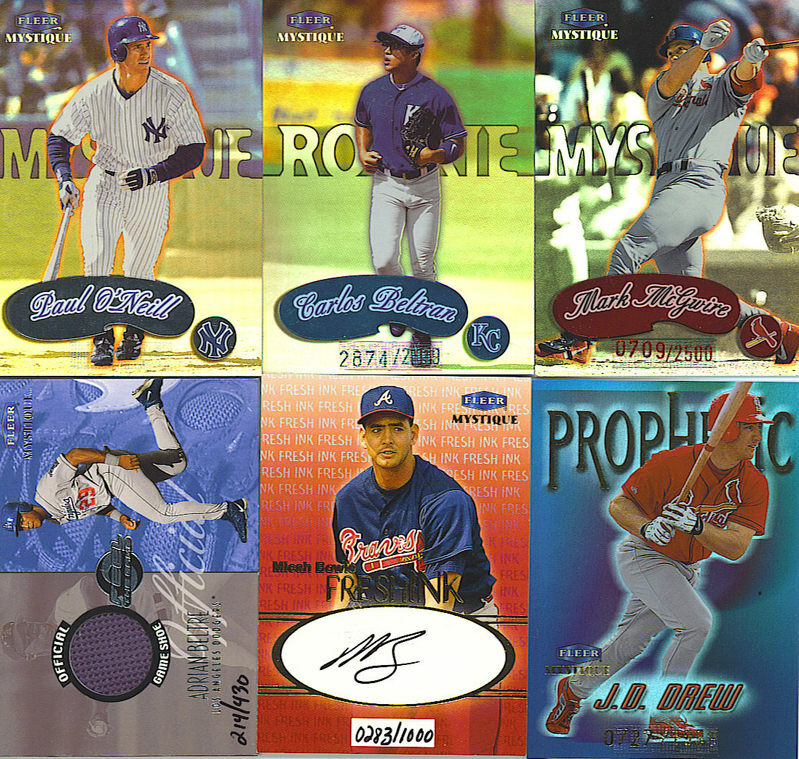 Inserted at a rate of 1 in 40 packs, the Fresh Ink set from 2000 Fleer Mystique featured a bevy of star autographs which included the likes of Tony Gwynn, Andruw Jones, Will Clark, Mike Mussina, Lance Berkman, Carlos Delgado, Magglio Ordonez, and Cal Ripken, Jr. This set is significant as it included the first-ever certified autograph of Hideo Nomo, who was with the Detroit Tigers at the time. Needless to say, that card regularly sold for hundreds when it appeared online. I pulled one of these autographs a while back but obviously, I pulled the wrong Tiger. Boxes of 2000 Fleer Mystique can be found online for approximately $40-45. In each box, collectors not only have a chance at pulling one of the 47 Fresh Ink autographs, not to mention Feel the Game and 3000 Club memorabilia cards as well. Gold Parallel: Nothing too exciting about this. These were found in the mystery packs and basically just feature a gold name plate. They were seeded 1:8 packs, but I only received 2 in my 24-pack box. They were Todd Helton and Jason Kendall. Next. Stars Subset: The stars subset featured 10 of the game’s (then) top stars. They were limited to 2500 and had a red name plate. I pulled Mark McGwire here. Prophetic: This was another beautiful set. The scan doesn’t do it justice. This one featured the game’s best up-and-coming stars. They were numbered to 1999. I pulled J.D. Drew. Others in this set included Pat Burrell and A.J. Burnett. Destiny: This was a flashy insert set numbered to 999. I pulled an Orlando Hernandez, but as I write this, was unable to find it! I hate having so many trade boxes with such little organization! 😛 Another beauty, this card featured a purple background. FreshInk: Ah, the good ol’ days of autographs. These were all on-card, had an authentication stamp on them and were hand-numbered on the front. They only fell in every other box on average so there was no guarantee to hit one, but I did find a Micah Bowie out of 1000. OK, so it wasn’t the greatest, but I’m still not complaining. Feel the Game: While the FreshInk cards came in 1:48 packs on average, these cards were just randomly inserted with no stated odds. The cards in this set are limited to anywhere between 415-450, with a shortprinted ARod numbered to 345. These cards weren’t all jersey cards, however, which was cool. Aside from a jersey, one could find game-used gloves and shoes in this product. I was lucky enough to pull a game-used shoe card of Adrian “I had 48 home runs in a contract year and have sucked before and after that year” Beltre. It is numbered out of 430. All in all, this was a pretty good box. I beat the odds tremendously on the game-used/autos, getting TWO when I wasn’t guaranteed to hit ONE (it was 1999 afterall). I didn’t get any dupes from this box which was good as well. The only downside was that a few cards from this box had BAD peeling to them, which of course I cannot get replaced now. That wasn’t a surprise to me though as that was an always an issue with this set. Aside from that, everything was great. When you can find them, boxes of this product go for around 60-ish online. I definitely think it’s a product worth checking out. Peeling the mystery cards is fun (or annoying depending on how you look at it)!